Mewsette has a quiet nap on my bed in the afternoon. The maple outside the window that casts green tones on my bed all summer now casts shades of yellow as the leaves begin to turn on a sunny autumn afternoon; the bedspread is actually solid white. Some other cats had their way with the covers, leaving a rumpled mess that added character to the simple scene. I don’t usually go for a scene this complicated on a weekday afternoon, but I just couldn’t let it go. It’s the same bed and reminds me of “Afternoon Nap”, and I’m oh, so glad I took the time to capture that one. Hope everyone had as great a day as Mewsette! 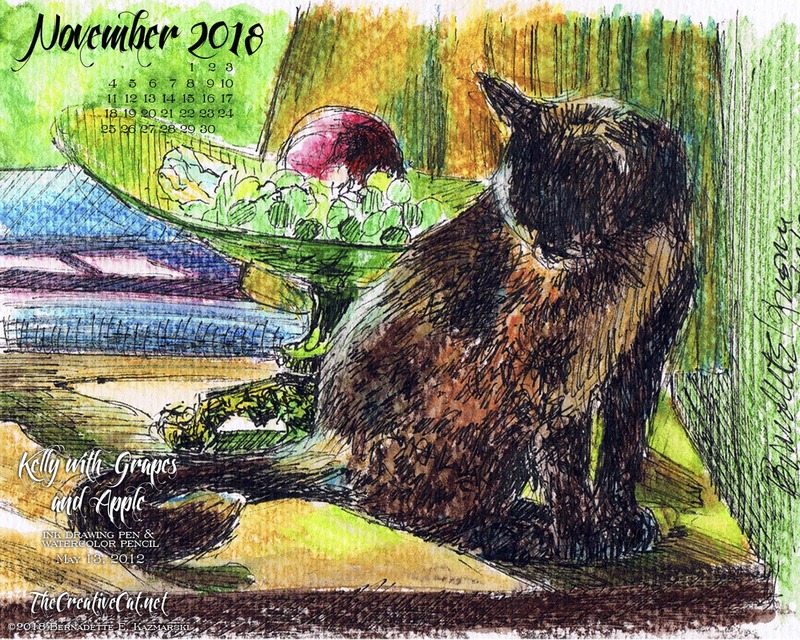 “Autumn Afternoon Bed” was the featured print in my September 2016 Feline Sampler Box. You can order a print of this little sketch in various sizes, matted, printed on canvas, even framed. Visit Portraits of Animals. I’ve been waiting for this one to come around again!